More mystery strips, today the letter G.
The Gilmore Brothers' Music Scene - Douglas and Keith Gilmore - Telstar - weekly strip - 1975 Miscategorized -- was a text column feature. Thanks Ray Bottorff Jr! Grandfather Clause - Chris Wright - Creators Syndicate - daily and Sunday strip - 2000-01 FOUND! existence verified by Charles Brubaker; thanks Charles! "Grandfather Clause" ran in Seattle Post Intelligencer when it was still in papers. I don't have any clippings, although I can confirm it ran in papers. samples of the strip in those issues. I've got photocopies of Wiseman's "Grace And Looie" panels (and also his "Chameleon" strips). Quite a drop in quality from his "Dennis the Menace" comics. He really needed to hire a gag writer. Don't know if either actually ran in newspapers though. Do the copies give any clues as to whether they were made from a newspaper, original art or proofs? It's usually pretty obvious. If they appear to be from a newspaper (and I agree with that assessment) then they constitute proof. Can you send me copies or email pics? If you do, be sure to send your address so I can send you a goodie package! Greg-Jim Adventures (1938-1940) Star Newspaper service. This must have been in The Star Weekly, a weekend supplement available across Canada. I could not find any in the daily newspapers. Gregory Clarke was a well known columnist and apparently a friend of James Frise (1891-1948) since he wrote a memoir about Frise with an introduction by Gordon Sinclair (also a poplar columnist and TV personality) titled FRISE in 1965. Stumbled upon "Geriatrix" by Paul Norris and Lyle Swigert. You should come up with the Oswego County Messenger of 1981 -1984. Notice the copyright on the panels don't match the paper's dates; they seem to have started late and printed 'em more than once a week. If you search for that Fred'nand strip and go to the Oswego County Messenger items (say #176-200 and #251-275) you'll find other Copley strips and panels. "Of All Things" by ?Phil G??? Hey DD, great find there! That website is a bear to work with, but I did eventually find all the features you mentioned. Geriatrix, Pisces and Consumer Carnival will go into the SG index, Putterin' Pete I have to disqualify as more of a handyman feature. Of All Things might have qualified but I could find just one example and can't read the creator name. Since its not in the E&P listings there's just too little so far to go on. Goodie box is on the way to you! Ground Zero was in the Los Angeles Times. Got any samples you can share with us? On that website, you can also find another Copley strip - Peaches by Paul Ullrich. I don't know if that one's a mystery strip or not, though. Peaches I do have, that one ran a long while (82-88 at least). "Green Force Five" was an ecological daily strip featuring a team of five people and a leopard, written by Argentinean Alfredo J. Grassi and drawn by his countryman Miguel Angel Repetto. I believe Osvaldo Blanco did the translation to English. It was published at least in several European countries, I don’t know of any publication in the USA though it might surface in some obscure newspaper. I did one of your "Mystery Strips". I went out with Ground Zero (prophetic name) in January 1987 and quit it in November of the same year. I had been a magazine gag cartoonist up to that time and couldn't make the transition. Thanks for coming by. I have Ground Zero starting January 12 which jibes with your msg, but LA Times dropped the strip on 8/29. Any chance you could tell me the official ebnd date in November? John Adcock, at Yesterday's Papers, has found (The Adventures of) Ginger Blue and Captain Flame, Frontier Fighter in the pages of 1953's Horry County News as syndicated by Charlie Plumb's Ad-Features Syndicate. If you Google News search for the Horry County News for 1953 you can bring up the May 28, 1953 edition which premieres the strips. On the side of the two strip are introductory articles about both the strips and the artists, those articles say Charlie Plumb is the writer of both strips. Google News searching Captain Flame will bring up the Southeast Weekly Bulletin which ran Captain Flame during the 1950s as distributed by the Smith Service. The February 10, 1955 edition of the SWB has the strip signed by Bruce Darrow. By February 20, 1958 it is signed by Don Sherwood and titled Captain Flame & Ginger Blue. Continuing with the Southeast Weekly Bulletin into the sixties and still running Smith Syndicate strips there is Going West with Hossface Hank in the October 31, 1963 edition. By April 9, 1964 the title is shortened to just Going West. In 1953 Charlie Plumb, along with putting out Captain Flame and Ginger Blue supposedly syndicated (The Outbursts of) Mr. Biffle. Haven't found that one, do you have it in your records? Charles H. Wellington started his syndicated cartooning career with World Color Printing in 1904. He was an excellent cartoonist from the start, his ideas were fresh and funny and best of all (from the syndicate's perspective) he was a real workhorse. Wellington was one of the backbone menbers of WCP's staff through 1907, until the call of New York finally became too strong. His first job in the Big Apple was with the New York World, where he only managed to make a single sale. He found a much more receptive audience in the Hearst camp, though, and produced many daily-style series for them, mostly for the Evening Journal. In May 1911 Wellington produced an innocuous and short-lived strip called His Noble Son-In-Law. There were less than ten installments of the series. The idea was anything but fresh and pretty much ran the course in that short time. The plot was already old hat. Starting in the American gilded age it had become fashionable for social climbing debutantes to marry titled beaus from Europe. In real life, and in the funnies that mirrored it, many of these dukes, earls and other assorted peers turned out to be penniless lazy neer-do-wells. Many of the titles were real, but the gents often failed to live up to their impressive names. The phenomenon became a favorite target for humorists, and His Noble Son-In-Law is one of many times the subject was mined for laughs. The short-lived series was eminently forgettable, or at least seemed to be forgotten. Wellington went on to create other series for Hearst in 1911, then made a jump over to the New York Globe, where his work was sometimes picked up by the Associated Newspapers cooperative. 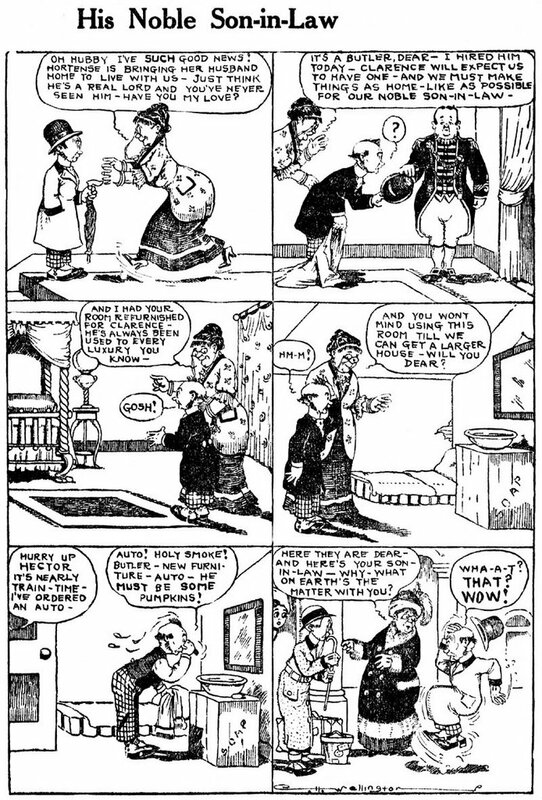 In late 1913, while apparently still working for the Globe, Wellington began a new Sunday strip for the McClure Syndicate titled Pa's Imported Son-In-Law. It was a direct descendent of the original series. The strip began on 10/19/1913, and once again Wellington didn't stick with it long. 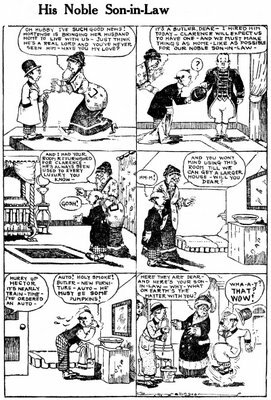 His last strip ran on 1/4/1914, after which the title was continued by uncredited cartoonists (one of which was Ed Carey). This version of the strip lasted until at least August 1914, and then was revived by McClure as Return Engagement of Pa's Son-In-Law on 4/18/1915. This version, now signed by Ed Carey, ran until 7/2/1916. But Wellington wasn't done. He left McClure to return to the Hearst fold, and continued the series yet again, this time as That Son-In-Law of Pa's, for Hearst's Newspaper Feature Service syndicate. This series started on 12/8/1913, and a daily version was added in 1915. This series met with good success as part of the NFS package, and Wellington stuck with it for Hearst until October 1920. But Wellington wasn't quite done switching syndicates. The next, and last, move had Wellington jumping yet again, this time to the New York Tribune's syndicate, where the strip made its last name change, to Pa's Son-In-Law. Apparently now tired of jumping syndicates, Wellington continued the strip here for over two decades. It finally expired on 5/17/1942. Our sample today is the very first strip from early May 1911. I’m happy to find an authoritative corroboration of the fact that “Pa’s Son in Law” (to use this as a common title for this messy production) was, in fact, **two** different series (like “The Katzenjammer Kids” and “Captain and the Kids”, “The Newlyweds” and “Their Only Child”, or the two “Yellow Kids”, or the two “Buster Browns”) and not, as many books assert, one single series that, for a while, was drawn by Ed Carey and featured the antics of Charles Chaplin. Nothing new under the sun (it seems that cloning series was a popular sport at the time) but with some oddity, for instance the fact that, for one month or so (1913 Dec 8 to 1914 Jan 4), Wellington signed two identical series with exactly the same cast of characters (Pa, Cedric, etc) for two competing syndicates. Concerning the Mc Clure series (“Pa’s Imported Son In Law”), some early pages were titled “Pa’s British Son in Law” (for instance, 1913 Nov 2). After the 1914 ? ? - 1915 Apr 18 hyatus, on 1915 May 9, the character of “Charlie Chapman” was introduced: he was a clone of Charlie Chaplin, and became the main star of the strip, that in 1916 was retitled “Pa’s Family and his Friends”. On the Hearst side (“That Son of Law of Pa’s”), the earlierst sample of the daily Hearst strip I saw is from Oct 12 1915; probably the daily begun on Oct 1: an article on the “Middleton Daily Times Press” of Sep 30 announces its beginning on that date. The latest sample I saw is from 1920 Aug 2: probably the daily ended later, when Wellington switched syndicates. I think the December 1913 overlap is reasonable considering that Wellington would have been working ahead for McClure. I probably should have mentioned the Charlie Chaplin connection, but the post was getting awful long! Thanks for the daily start date, but 10/1/15 was a Friday, so I have to wonder if that's really the start. The daily, by the way, lasted until at least 1941 and probably until the end in 1942. I just found your site. As an artist/cartoonist/history buff, it tickles me to no end to find something that covers ALL of my interests in one spot. I've been digging into C.H. Wellington's work. He had an interesting style. I found some of his strips on newspaperarchive and newspapers.com. I'll post anything I find. Meanwhile, I'll keep browsing. Some of the older artists and strips are better that the bilge being put out now. Agnes Dale Crosby, wife of Percy Leo Crosby, creator of the comic strip character "Skippy," yesterday was granted a temporary divorce from her artist husband in Fairfax County Circuit Court by Judge Waletr T. McCarthy. Charges of cruelty were brought by Mrs. Crosby against her husband. Judge McCarthy ordered Crosby to pay $14,500 annually to his divorced wife. He also ordered the transfer of two tracts of land in Fairfax County and 1,400 acres in Loudoun County to Mrs. Crosby. Under the court order, Mrs. Crosby retains custody of the four children, Percy, 9; Barbara Dale, 7; Joan Caroline, 6 and Carol, 5. While artist Crosby is given the privilege of visiting his children, the court decree contains an injunction restraining him from interfering with his wife or children or seeking to gain control. In her petition Mrs. Crosby charged that her husband had on several occasion assaulted her. An indenture was made between the couple on May 11 providing for a lump-sum payment of $15,000 by Crosby to his wife. They were married in New York City on April 4, 1929. The newspaper business, which has contributed heavily in personnel to practically all professions, has given a large number of actors to motion pictures, a survey of Hollywood revealed recently. Four cartoonists, 10 reporters, and advertising and circulation department representatives have been graduated into the ranks of the film stars, among other employees of newspapers. Gary Cooper, currently in "Souls at Sea," was at one time a newspaper cartoonist, and the story concerning the firing of John Barrymore, another artist, by the late Arthur Brisbane, is now historical. Leo Carrillo, now in "Hotel Haywire," was a cartoonist in San Francisco, and Keye Luke, Chinese character actor, is famous for his newspaper and magazine drawings. Des Moines, Feb. 15 - State police tonight guarded Jay N. Darling ("Ding"), nationally known newspaper cartoonist and sportsman, against reports that he was next on gangdom's list of intended kidnap victims. Secrecy veiled investigation by State and Federal officers, but Federal Agent O.C. Dewey announced that evidence of a carefully planned plot to abduct Darling had been discovered. In their efforts to provide every safeguard, the officers kept the cartoonist's whereabouts secret. The purported plot was discovered while Darling was returning from Washington, where he attended a conference of President Roosevelt's wild life conservation committee. A telegram, signed with a fictitious name, asked Darling when he would arrive in Chicago and where he would stay. Officers indicated they had traced the telegram to a supposed Chicago gangster. Federal agents guarded Darling while he stopped in Chicago and escorted him to the Iowa border, where State officers joined him. Since his return to Des Moines last Wednesday, the State agents have been with him constantly. A farmhouse near Creston, in southwest Iowa, figured in the purported plot, the officers believed. The farmhouse, definite location of which has not been determined, also was mentioned as the possible hideaway of the Edward G. Bremer kidnapers. The officers indicated their belief that a definite ransom demand for Darling's release had been fixed in event the kidnaping was effected. The announcement of the supposed plot was amde, Dewey indicated, in the hope that publicity might serve as a warning and discourage attempt to carry out the abduction. Darling, widely known for his cartoons in newspapers and magazines, also is prominent for his work in conservation of the Nation's wild life and his broad acquaintance in political fields. New York, Feb. 24 - Robert L. Ripley, the cartoonist of "Believe It Or Not" fame, is being sued for $500,000 for alleged breach of promise of marriage by Marion Ohnick, 37, a prima donna, who formerly appeared with the San Carlo Opera Company in the title role of "Madame Butterfly." Miss Ohnick, who also is known as Haru Onuki, of Long Beach, Calif., has been appearing recently on a vaudeville circuit, her attorny, Abraham Greenberg, said. Chicago, June 15 - Gaar Williams, 54, veteran newspaper cartoonist, who drew whimsical studies of "Just Plain Folks," died today in Passavant Hospital after being stricken with a cerebral hemorrhage. He died four hours after being stricken as he sat in his automobile on Michigan Boulevard with his wife and Miss Blanche Stillson, of Indianapolis. Funeral arrangements awaited word from the artist's mother in Richmond, Ind. Williams was the creator of the comic strip "A Strain On The Family Tie" and "Zipper," the comic dog. Formerly a political cartoonist for the Chicago Daily News and the Indianapolis News, he reached the height of his popularity with his "Silky" comic strips of later years. He turned to comic drawing after joining the staff of the Chicago Tribune in 1921. New York, Nov. 24 - Charles R. Macauley, 54 years old, a well-known newspaper cartoonist, died today at St. Vincent's Hospital from a cardiac ailment growing out of an attack of pneumonia. Mr. Macauley served for several years as a cartoonist on the old New York World. He also worked on the Brooklyn Eagle and the New York Daily Mirror. He is credited with originating "The Big Stick" President Theodore Roosevelt was so often pictured as carrying. San Francisco, Nov. 30 - C.A. Bronstrup, political cartoonist and a member of the San Francisco Chronicle 20 years, died today from a heart ailment. Cleveland, Jan. 26 - Irving S. Knickerbocker, staff artist for the Newspaper Enterprise Association here and known in the cartoon world as "Nick" [actually Knick - ed] was killed in an automobile accident here today. His car struck another car and glanced off into a telephone pole. William A. Rogers, 77, noted cartoonist, died at his home at 3331 P street northwest, early yesterday after an illness of less than a week. He was formerly on the staff of the Washington Post. Mr. Rogers was born in Springfield, Ohio, May 23, 1854. In 1873 he began his career in New York City as an illustrator and cartoonist for the Daily Graphic. He was later on the staff of Harper's Weekly, Harper's Magazine, Life, St. Nicholas, Century, the New York Herald and the Washington Post. He came to Washington in 1923. Among his personal friends Mr. Rogers numbered President Theodore Roosevelt, President Grover Cleveland and Jules Jusserand, former French ambassador to the United States. It was at the suggestion of the latter that he was made a chevalier in the French Legion of Honor for a cartoon published in the New York Herald during the World War. Mr. Rogers is survived by a daughter, Mrs. W.W. Buckley, of Washington, and a son, Harry A. Rogers, of Wilton, Conn. Funeral services will be conducted in Springfield, Ohio, tomorrow afternoon. Here's a group of cartoonist death notices, all gleaned from the Washington Post. Cleveland, Dec.29 - Walter W. Blackman, 65, for 21 years political cartoonist for the Birmingham, Ala., Age-Herald, died today at his home in Willowick, Ohio, east of here. He was a member of the Gridiron Club and the National Press Club of Washington. Originator of one of the first animated motion picture cartoons, he used the idea in connection with the Government's Liberty Loan campaigns. Years ago he obtained a patent on a process for making motion pictures in natural color. While a cartoonist for the Birmingham Age-Herald he was sent by his paper to campaign on political issues. New York, Nov.22 - Walter C. Hoban, 49, widely known comic artist and cartoonist, died last night after a two-month illness. He was with King Features Syndicate for more than 20 years. He was best known perhaps for his comic strip "Jerry on the Job." New York, Aug.14 - T.E. Powers, 69, noted political cartoonist of the Hearst newspapers for more than 40 years, died today after a two-year illness. One of the earliest political caricaturists of modern journalism, Powers was the favorite political cartoonist of President Theodore Roosevelt. Powers retired several years ago due to ill health. Carmel, Calif., Sept. 10 - Bob Edgren, 65, famous sports editor and cartoonist, died here last night after a series of heart attacks. Edgren for many years was sports editor of the old New York World. Surviving are his wife, a son and three sisters. Philadelphia, Jan. 9 - Joseph W. McGurk, 52, illustrator and one-time sports cartoonist, died last night. Waterford, Conn., March 6 - Walt McDougall, 80, dean of American cartoonists, author and humorist, was found dead today on a couch in his Fern Lane farmhouse. Dr. Frank Dunn, medical examiner, said McDougall's right hand clutched an old-fashioned "horse pistol" and that his death was suicide. McDougall, generally regarded as the first American [daily newspaper] cartoonist, contributed to the old New York World and to the Philadelphia North American. He also did strips for the McClure Syndicate and nationally known magazines. Among his better known ones were "Absent Minded Abner," "Fatty Felix," "Hank The Hermit," "Teddy In Africa" and the Rambillaux Series. His cartoon "The Feast of Belshazzar" was credited with helping to elect Grover Cleveland president. McDougall was once rebuked by the Supreme Court of the United States for drawing a cartoon showing justices of the high court chewing tobacco behind the bench. He was a personal friend of the late Theodore Roosevelt and covered the White House as a newspaperman in his Presidential regime. Hollywood, Calif., Oct. 15 - Will E. Chapin, 80, cartoonist and writer, died at his home here yesterday. New Rochelle, N.Y., Aug. 27 - Heart disease brought death today to Frederick Burr Opper, 80, creator of Happy Hooligan, Alphonse and Gaston, and other comic strip characters read around the world. He was forced by failing eyesight a few years ago to retire from active work for newspapers with which he had been connected since 1899. Born in Madison, Ohio, the son of an Austro-Hungarian immigrant, Opper left school at 14 to work on the Madison Gazette, a weekly newspaper. A year later he went to New York. When he submitted some of his sketches to magazines they were promptly purchased. Then Col. Frank Leslie hired him as a staff artist for Leslie's weekly. Three years later he went to Puck, with which he remained until engaged for the New York Journal. With the rise of the syndicate system, his cartoons were circulated throughout the world. In 1900 he created the tramp with the tin hat, Happy Hooligan, best known of his characters. Opper for many years was an outstanding political cartoonist, during the McKinley and Theodore Roosevelt campaigns. His "Willie and Teddy" series had the nation roaring. New York, Dec. 27 - Clive Weed, artist and political cartoonist, died today in a hospital here of pneumonia. He was 52. Weed studied art at the Pennsylvania Academy of Fine Arts, where he was a favorite pupil of the late Thomas Pollock Anshutz, instructor of many noted American artists. In 1910 he joined the staff of the Philadelphia Record, and a year later went to the Philadelphia Press, where his chief work was illustrating news stories. He joined the New York Evening Sun in 1912, and one of his first assignments was to sketch the survivors of the Titanic disaster. He became political cartoonist for the old New York Tribune, the Philadelphia Public Ledger, and editorial cartoonist for the magazine Judge. His drawings also appeared in Colliers, the American Magazine, Leslie's and Life. Weed returned to newspaper work in 1927 as cartoonist for the New York Evening World, and once the last edition of that paper was published he had been with the King Features Syndicate. Glendale, Calif., July 4 - Charles Chandler Reese, 74, newspaper illustrator and cartoonist, died at a hospital yesterday of the infirmities of age. His career included prominent posts of New York, Pittsburgh and Philadelphia newspapers. During the Spanish-American war his sketches on the field of action in Cuba appeared in the New York World, drawing wide attention. Reese claimed to have been the first artist to have a picture reproduced as a double-truck, or two-page, illustration in a newspaper. Born in Pittsburgh, Reese lived in the East until he came here six years ago. He was prominent in the Elks and was past exalted ruler of lodges at Hackensack, N.J., and Staten Island, N.Y.
Chicago, Ill., Oct. 20 - Sidney Smith, 58, creator of "The Gumps," one of the most popular of all newspaper cartoons, was killed at 3:45 a.m. today in an automobile collision near Harvard, Ill., a few miles from the Wisconsin boundary. Smith, at the time of the accident, was alone. The previous afternoon he had been on a gay outing at Lake Geneva, Wisc., in celebration of a three-year extension of his $150,000-a-year newspaper syndicate contract. He had gone from his home in Chicago to the Wisconsin resort to meet with syndicate officials and sign the contract extension. He then invited the syndicate men to spend Sunday at his nearby 2,200 acre Shirland farm. When they preferred to return to Chicago Smith drove them to the city, then started back toward the farm. It was late at night. To break the long, solitary drive, the cartoonist stopped at the Bubbling-Over Tavern, 6 miles south of the point where he met his death. At the roadhouse Smith entertained the patrons by drawing pictures of the cartoon characters he made famous throughout the world. About 3:30 a.m. he started on the last lap of his journey. He was driving a small sedan. Another sedan, headed south and driven by Wendell Martin, of Waukesha, Ill., collided with Smith's car. Although there were no witnesses it is believed the two machines met almost on the center line of the highway. Smith's car was whirled around, thrown off the road and against a telephone pole. The top of the cartoonist's head was crushed in. Marlin suffered a broken hip, fractured jaw, and other injuries. Smith's body was brought to a Chicago undertaking parlor and from there will be taken to his Chicago residence, 1500 Lake Shore Drive. Funeral services will be held at his home Wednesday. Internment will be in Rose Hill Cemetary here. Survivors are his wife, a son, Robert Sidney Smith, 25, of Phoenix, Ariz., and a daughter, Mrs. Gladys Lucknow, of Lauderdale, Wis.
Smith's first wife, Gentraude Craddock, of Pittsburgh, died in 1924. His second marriage took place in 1926. Sidney Smith was born in Bloomington, Ill., on February 13, 1877, the son of Dr. T.H. and Mrs. Francis A. Shafer Smith. His father was a dentist and wanted the son to follow him in his profession. But Sidney, from boyhood, showed an inclination to spend most of his time bending over a drawing board. When he was 18 he was drawing for the Bloomington Sunday Eye. From Bloomington he went to Indianapolis, where he joined the staff, first of the News, then of the Press. Later he went to the Philadelphia Inquirer, the Pittsburgh Post, the Pittsburgh Press, the Indianapolis Sentinel and the Toledo News Bee. But his drawings for all these papers were centered around a human goat called "Old Doc Yak." Not until 1917, when he was on the art staff of the Chicago Tribune, did Smith conceive the now-famous Gump family. Between the birth of Andy and the burial of Old Doc Yak, several other series, including "The Bunk of a Busy Brain," "Self-Made Heroes" and "Light Occupations" wandered across the cartoonist's drawing board. But it was with the Gumps -- Andy, Min, Chester, Uncle Bim -- that Sidney Smith won world recognition. The strip has been published throughout the United States, in Canada, Europe, Hawaii and Australia. In keeping up the daily and Sunday production the cartoonist was forced to build up a staff of artists and idea men. It was on March 15, 1922, that Smith signed the first $1,000,000 contract ever given a comic strip artist. The agreement was to cover a 10-year period and as a bonus, the creator of the Gump strip was given a Rolls Royce. At the time of the artist's death the comic was drawn three months in advance. His staff hopes to continue the adventures of the Gump household. Hollywood, July 18 - Mrs. George McManus, 82, mother of George McManus, cartoonist, died here today. Born in Limerick, Ireland, she came to the United States when she was a small girl. Her first home was in St. Louis, but she went to New York after her marriage to George McManus, Sr., stage actor. She came here a year and a half ago. She is survived by one other son, Charles McManus, of New York. George lives here. While I wouldn't call him my favorite, I count Powers as one of the greats. Don't judge him by those silly Joys and Glooms characters. His editorial cartoons were beautifully rendered, and his humor work , sometimes done in an intentionally naive style, was very funny stuff. You want to see bad cartooning, just open up today's paper or the latest New Yorker.